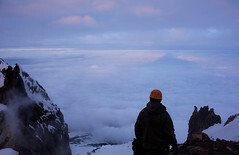 Joe asked me recently why I’m climbing Mt Hood again and suggested I try something else, like maybe Mt St Helens (though he probably didn’t know I just climbed Mt St Helens earlier this spring). My flippant response was to make an analogy to one of my favorite runs in college–we probably ran it once/week, but it could never be the same run twice. Sometimes you felt great. Sometimes your running shoes had been mysteriously replaced by lead-lined boots and your lungs by peapods. On the best runs, the autumn was crisp, the leaves in Upstate New York would be at their magnificent dying best, and it felt great to be alive–and even better to be out reveling in this vitality by churning out a steady nine to ten miles, cheeks and thighs tinted pink by the combination of effort and chill in the air. Other times you’d be out there internally conducting a meditative discourse about pushing harder or hot showers or food or girlfriends or classes or nothing, while the November Ithaca rain and sleet soaked you through, while you were surrounded by a half dozen of your friends and teammates who were all carrying on their own versions of similar conversations. Yes, just like running the same route, you can climb the same mountain every day of the year and it would be a different climb every single time. Your body would feel and respond differently each time, your mental state would certainly vary from climb to climb, and there is no doubt that you would learn something new every time. If none of the above were true, then you were more than likely not alive. Not living, anyway. Regardless, although it seems I’ve climbed Hood a lot (the weather has helped me canceled plans more often than not, so if you hear me talking about climbing Hood in the future tense, it doesn’t mean I even left my favorite living room chair), I don’t know if I’ll ever tire of the view from the summit of the mountain that we can see from Portland every day. Every clear day, that is. 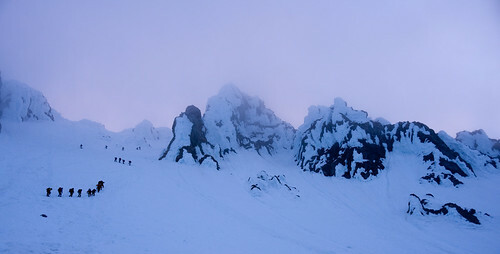 So it was that five of us set out for the summit of Mt Hood just before midnight on Saturday, June 13. Sharon and I had been planning to climb Hood a couple of days previously, but the chance of thunderstorms in the forecast kept us home. I had planned to climb with another group the previous weekend, but I said no go, due to anticipated snow and clouds at elevations we’d like to be climbing through. So Sue, Rob, and Sharon’s boyfriend Adam joined us on a night when it looked like we’d get a bit of a window of fair weather. 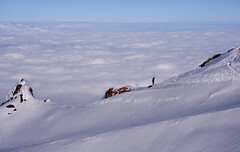 Our plan was to climb the South Side, starting from Timberline, slog up the snowcat trail to the top of the Palmer snowfield, hit the Hogsback, and then climb through the Pearly Gates, where Sue had heard that friends had a good climb in the last day or two. The mountain was calmly beautiful in front of us, the snow was pretty solid, and the air was warm with a slight breeze now and again to keep you cool. The Big Dipper was off to our left, still far above Illumination Rock, where it goes to hide in the wee hours, and I think I remember seeing the W of Cassiopeia up near the summit. Not long into our climb, it was obvious that clouds were coming in from the south and the west, as we climbed up and north. The mountain had melted out a lot since I’d climbed three weeks ago, causing bands of volcanic ash and rock to streak the snow between us and the visible summit. Fortunately, the clouds and fog coming in from the west seemed to hit a ridge just before reaching us and dissipate into the black and starry sky, joined by the half moon rising out of the east around two in the morning, adding plenty to the ambient light. While the cloud deck seemed to follow us up the slope, it was not windy, and it felt like they would stay below and out of our way. We reached the Hogsback at about five in the morning, having taken a few longish breaks on the way up. As we were approaching the Hogsback, Sue asked to have an honest conversation. I knew where she was going: was the party, which was starting to string out, up for the Pearly Gates. Not to mention, was I up for leading that route. It was obvious by then that to reach the Pearly Gates, we’d have to negotiate the bergschrund, which had opened immensely in the past few weeks, and which her friends crossed via a snow bridge in the middle, as well as do a traverse that was across moderately steep snow with a long runout below. I was tired. Tired isn’t quite right–weary is a better description. Normally, daylight served to give me a second wind. This time, I was not sensing a gathering resurgence of strength. Chalk some of it up to sleep being a little elusive over the past week. And just like running and racing, some days you’re on and some days you’re not feeling light and springy. Then there are the inner voices and visions that helped erode some of the desire to lead us through the Pearly Gates. Right in front of me were the sites of incidents that go deeper to one’s core than one cares to admit. There’s where John tumbled several hundred feet and broke two vertebrae a few weeks ago. There’s where a woman was struck by ice and killed the day after I climbed in January. There’s where I fell in January and slid too far, too fast before our rope yanked me to a stop. We decided to go up the Old Chute, which is where the rest of the climbers gathered in the early morning were headed. We followed a boot track from the Hogsback to the Hot Rocks where we roped up. We’d debated a bit on the way up as to whether we rope or not; everyone was comfortable going up unroped, since we all had second tools, but I said let’s rope when I thought about the top of the chute and the narrow catwalk leading to the summit. Somehow I would rather be roped when crossing, even though there are many good arguments against that practice. The upclimb and subsequent traverse to the summit took about an hour from the Hot Rocks area; I took us up a chute to the right of where the Old Chute tops out since it looked easier and avoided the catwalk. It was slow going, picking steps here and there in the snow and occasional section of ice, trying to be safe and not kick chunks onto the climbers below me. All the while, glances back over our shoulders gave us beautiful sunlit views of the layer of puffy clouds below, including the mountain shadow cast by the rising sun. We didn’t spend much time on the summit since it was chilly and we knew that getting back down to the Hogsback was something that needed to just get done. After some discussion of which chute to descend, we decided to traverse over to the top of the Old Chute. Once there, another discussion led to the building of an anchor for a rappel, since there was some discomfort with downclimbing unaided into terrain we couldn’t quite see. So two ice screws formed our primary anchor (and it was bomber), which was backed up by a solid picket. Rob was the first to rappel, and I followed to build an anchor at the end of the rap. Sue followed, and then Sharon set a few pickets to protect Adam’s downclimb, as he volunteered to be belayed by Sharon and clean the route. We got a good laugh as he turned up at the end of the rappel not very thrilled with the way the pickets jangled around his neck, getting in his way at every opportunity. Our laughter came from every one of us having been there before. Oh, I was slow picking my way down the rest of the chute to the Hot Rocks. The snow was in that slippery stage between being solid enough to just walk down and starting to show signs of being plunge-steppable yet still icy underneath. A long, sulfur-filled break preceded a short walk across the Hogsback to glissade territory next to Crater Rock. Finally, a chance to glissade Mt Hood once again. While there were too many icy spots for Sue’s taste, and most of our comfort, I’ll take a rough glissade over a walk down any time–within limits, of course. As we descended, the sun grew warmer and stronger, slushing up the slog from the Palmer to Timberline Lodge, a journey that, as Rob pointed out, is made more frustrating by the fact that you can see where your car is parked from thousands of vertical feet away. And it never seems to get closer. Of course, the parking lot is finally underfoot, and another climb is done, with everyone home safe and sound.